4-starred villa „Moses“ is a vacation villa for 10 people with a private pool. The pool is large, heated and with an overflow design. There is an amazing view stretching from Novalja's riviera, mountain Velebit to the islands surrounding Pag. There are a pool bar and a large sun terrace equipped with garden parasols and swings. Villa contains two large comfortable duplex apartments with galleries on both sides. Each apartment contains a kitchen equipped with kitchen appliances and utensils, a dining room, bedroom with a king size bed, a gallery day room with a king size bed, a bathroom, a toilette, a cocktail terrace with a spectacular view and a ground floor terrace. Every apartment and studio have a designated entrance but also apartments are connected via interior doors. The studio contains a king size bed, bathroom, toilette and a small kitchen. There are air conditioning units in each one of the villa's apartments. There is also free wi-fi, TV, parking and a barbecue stand. Pets are allowed only in agreement with the owner. 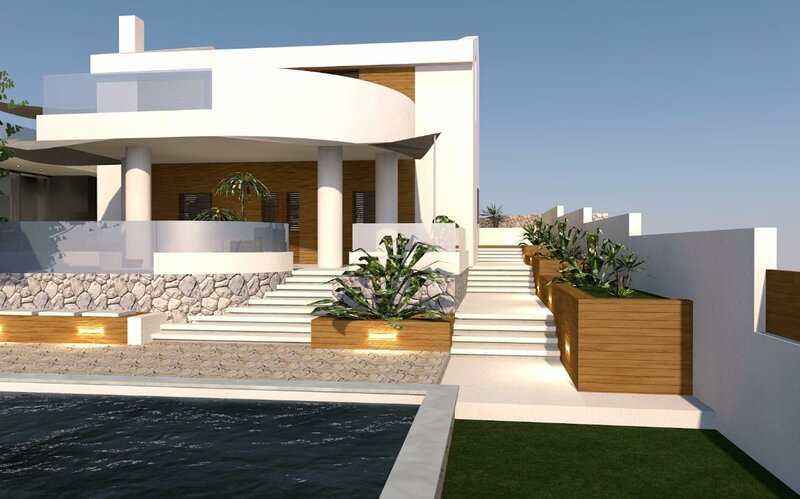 There is an additional living unit in the villa's garden which is designated for supporting the villa service. Additional offer: A la carte, dinner and ironing service, taxi, transfer, lunch or welcome dinner, free one drink at the pool, free daily housekeeping (optional). N +44° 35' 18" | E +14° 51' 10"